Today, the trees are forever blowing in one direction near the shore of Capiz. 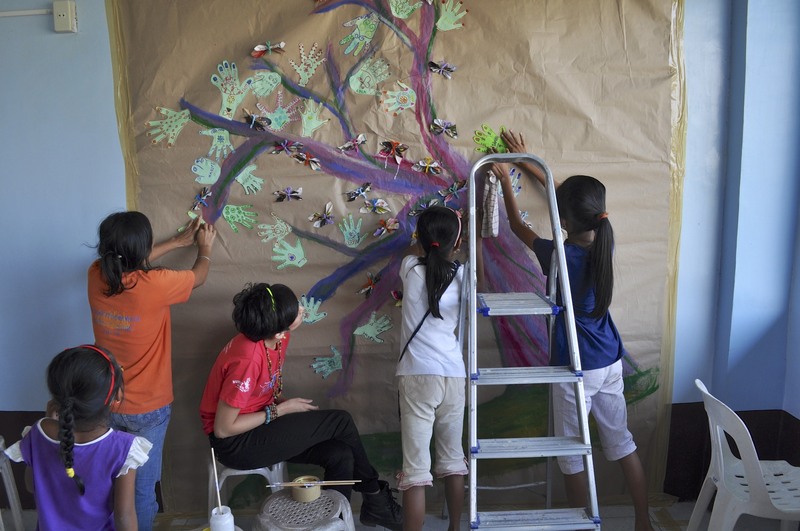 Ever since the super typhoon hit in November, all their branches sling away from the sea. Like a cartoon character’s long hair when someone yells in their face, or when it’s been electrocuted. But the trees aren’t cartoons, and Yolanda wasn’t playing around when she howled at the Philippines. Sustained winds were reported at at 195 mph, with gusts reaching even 235. 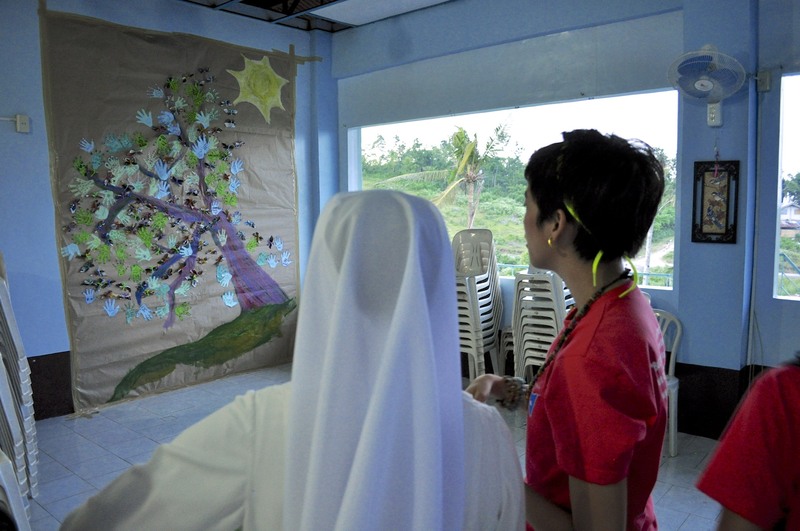 Internationally called Haiyan, the storm was locally known as Yolanda. In Roxas City, Capiz – glass shattered, signage torn off buildings, roofs whipped clear off their structures. Yolanda left a mess. In June last year I climbed a kalachuchi tree in our friend’s front yard in Roxas City. The kids, Carrie and Iggy, showed me the tree, and did tricks as I watched from a branch. It was a beautiful and strong tree. After Yolanda, this same kalachuchi tree now tilts, bowing away from shore, toward the mountain. It’s roots held on in the howling wind that brought down shanties, nipa huts, electric posts and uprooted many other old trees. Instead of helping the kalachuchi tree upright as they thought they might, our friends decided to let it grow as it was, now leaning at an angle. Two days later, in the storm’s wake, new green sprouted on the kalachuchi tree! The comfort of new life to come. 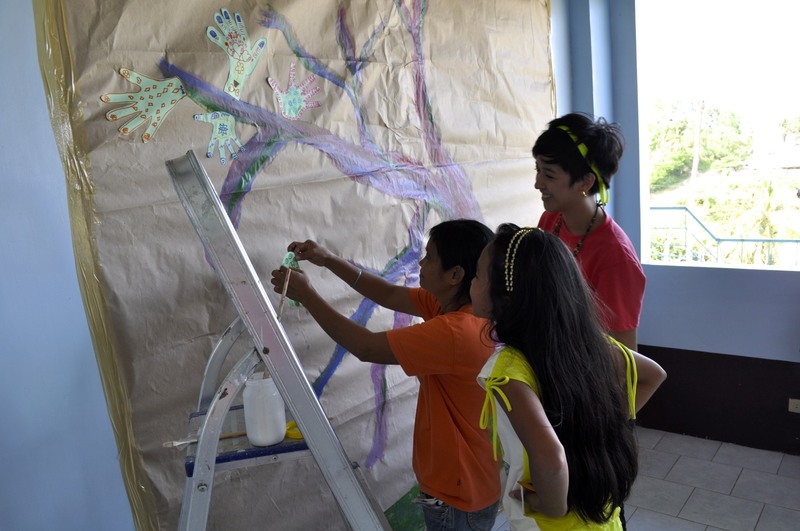 This tree became the inspiration for the art we made with the children of Capiz. 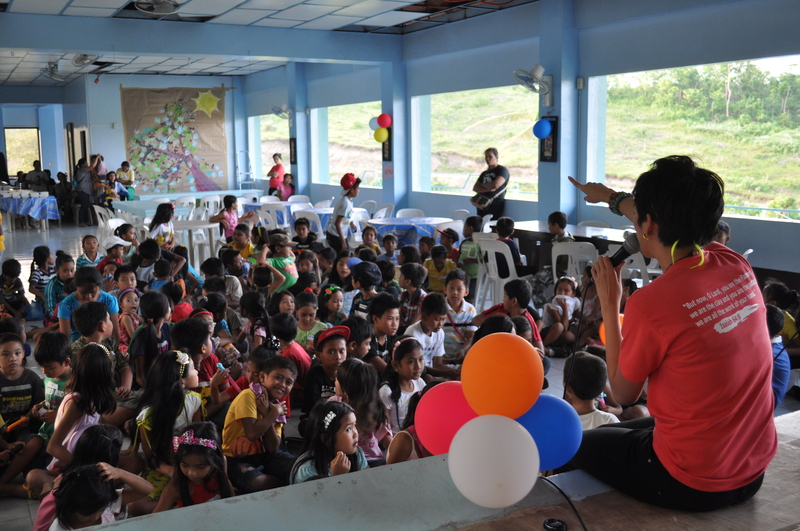 The secondary inspiration was the Buhay Makulay Children’s Fair we held in November 2013, at a girls’ shelter in Marillac Hills. 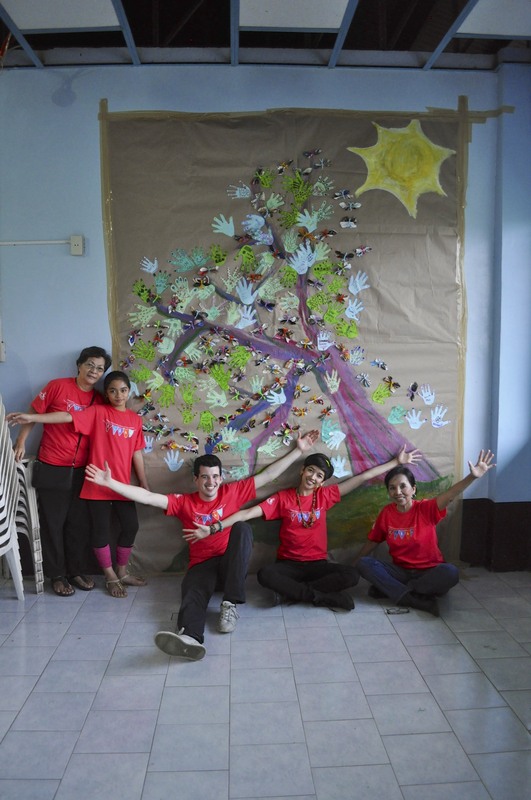 One of the highlights was a mural collage of butterflies made out of recycled magazine paper. I prepared a painting of tree – just trunk and branches. The rest was up to our special guests of the day, the girls of the shelter. 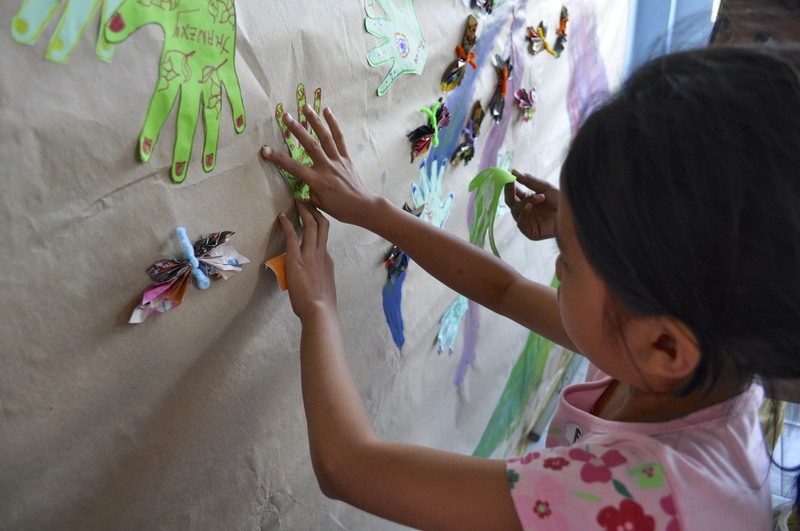 We taught them how to make these butterflies, and in the process, to consider the things they are thankful for. 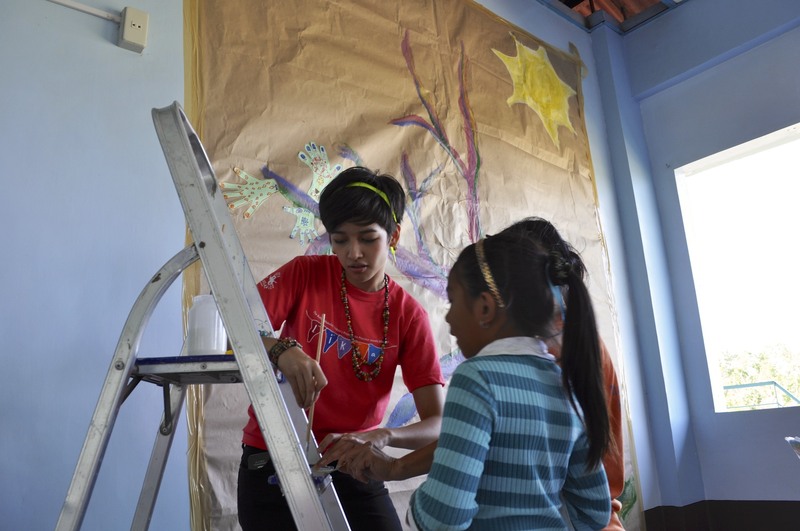 Each completed butterfly would represent something for which they give thanks – family, safety, a roof over their heads. 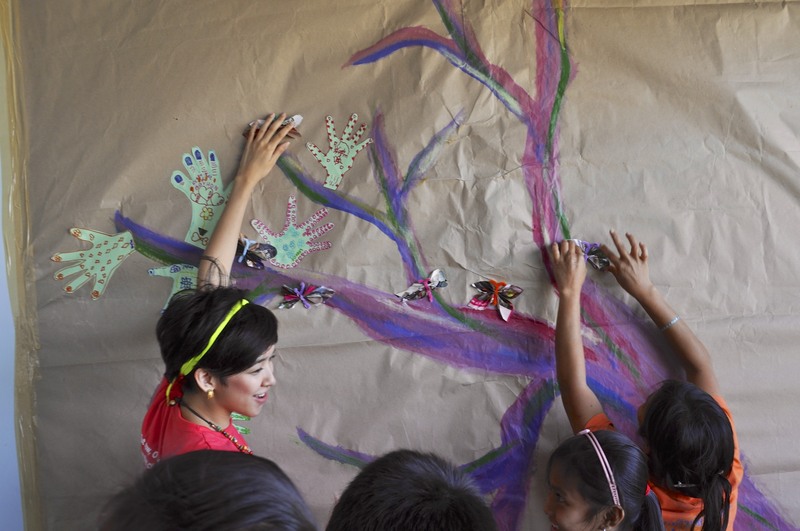 As the morning went on, each girl went up to the tree and added their butterfly. The result was beyond what I had imagined. 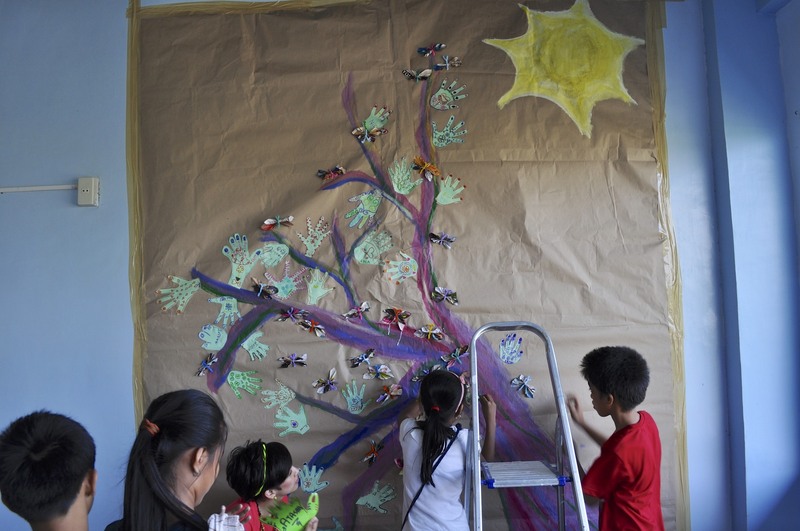 A breathtaking tree of thanksgiving, from girls recovering from abuse, abandonment or homelessness. 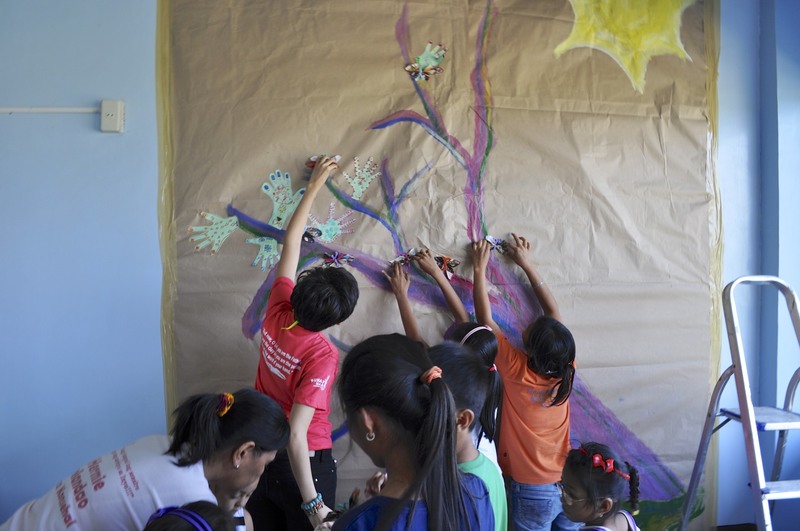 So last week, as we quickly planned the Children’s Fair for Capiz, we thought it would be great to bring a similar activity to the kids who experienced the storm. 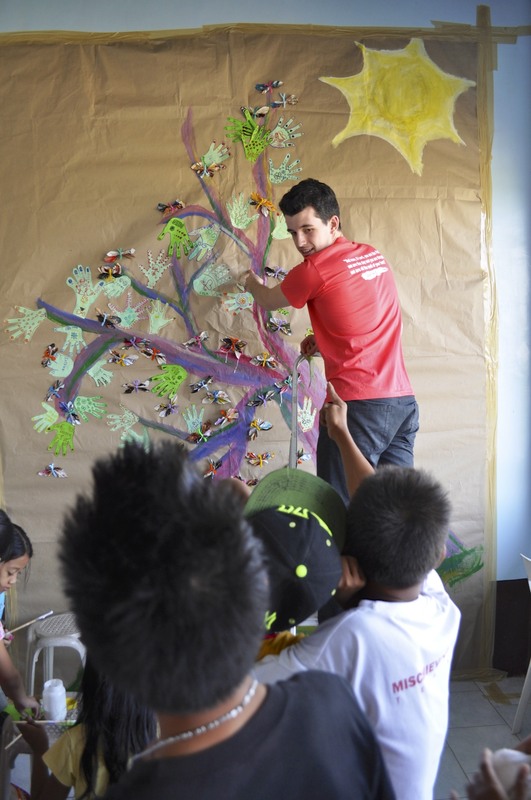 At that time, we hadn’t yet heard about kalachuchi tree story, and had no idea how it would later shape our afternoon with the children. 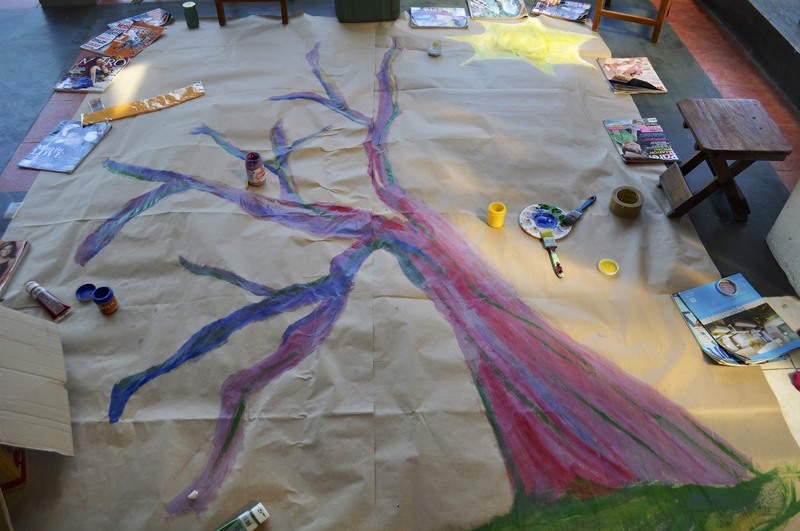 On Friday morning, the day of our fair, I laid out the brown paper on the floor and began to paint a tree. I held down the paper in the strong wind, with jars, magazines and chairs. In my line of sight, the storm-pitched kalachuchi tree. When we put it up on location, it was much larger than I had realized! We were on the third floor and because windows had not yet been replaced from the storm, steady strong winds blew through the space. We were worried the brown paper would tear. Then came 130 children! All from poor communities surrounding the school we were in. As we started the fair – an afternoon of singing, games and fun crafts, I had a chance to talk to the children. I told them about all the fun we were about to have, but more importantly of the tree that on the far end of the room. What was missing? I asked them. “Leaves! !” they told me. “Fruit! !” they exclaimed. We would have a chance to fill in the missing pieces! 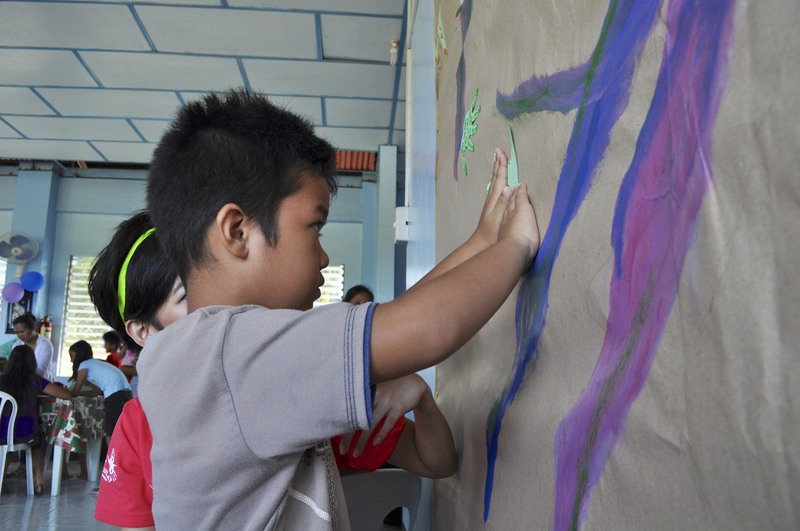 They’ll trace their own hands, decorate their handprint and cut it out. Their hands will be the leaves of the tree. They’ll fold butterflies out of recycled magazine paper and tie them together with pipe cleaners. Their butterflies will be the fruit of the tree. 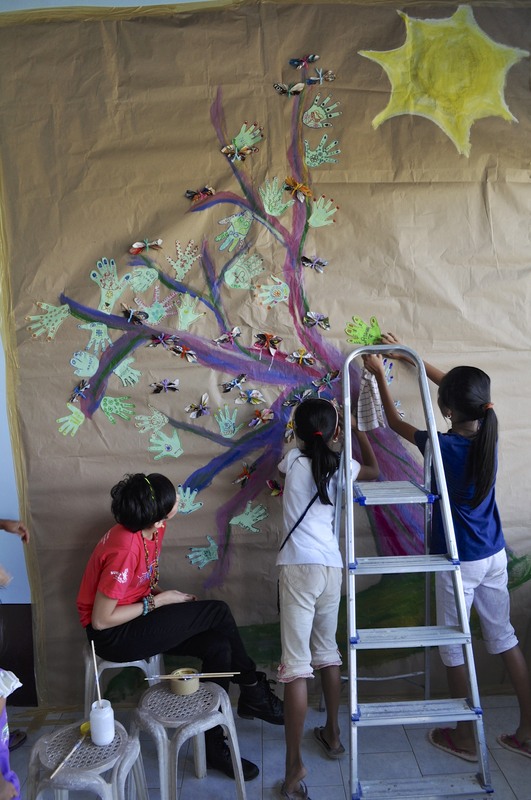 I had the joy of manning the mural station, where kids came up with their finished leaf-hand or butterfly-fruit, ready to add to the tree. They all came shyly forward, craft in hand. 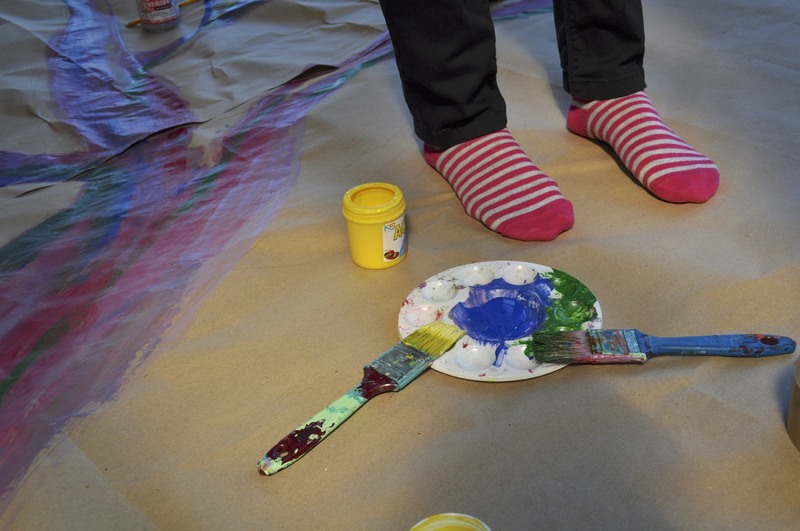 Some were too shy to paint on the glue themselves and even more embarrassed to glue it on the collage on their own. After putting their work up, I would give them high fives which would stir up their smiles. Others had scuttled away before I could turn around to face them from the collage! At the end of the day, we had a tree full of life and hope! Before dinner, we gathered them and told the story of the tree’s inspiration. Much of their world is now changed because of the storm. These kids may not have lost family, but they have lost food supply, a parent’s livelihood, a room, a roof, their whole home, or electrical power. We drew their attention to our own tree in the room. Nothing more was missing! Their own hands and fruit have filled in the space. Look at our tree! It may be leaning over, still bearing the weight of a historically catastrophic storm, but despite that, their is hope blooming. Just like the kalachuchi tree who shared new green in just two days, new fruit can be born of life that has been tackled down. Today, after the storm, perhaps we can see the tilt as beautiful and in time even find that the tree, and we, have grown stronger. Love and special thanks to the Conlu family, the Grand Gazebo in Baybay beach, Our Mother of Mercy Learning School Inc., and the Sister Servants of the Poor in Lawaan Capiz.